The Maxi II EX will appeal to a wide range of breeders including parrot breeders. 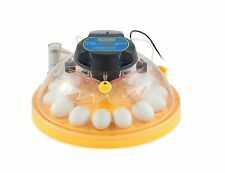 The incubator is supplied with two sizes of egg discs : one for 14 standard (chicken size) eggs and a second disc for 40 small (quail) sized eggs. The high frequency turn facility makes these refined incubators ideal for parrots as well as all other eggs up to duck egg size. The machine is supplied with two sizes of egg discs for standard (chicken) egg and small (quail) eggs.